Department of Journalism event examines the cost, ethics and unknown outcomes of medical interventuion to prevent mitochondrial transfer. 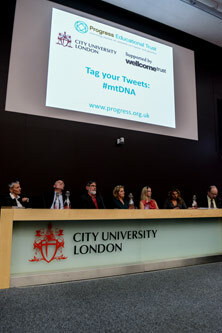 The Science Journalism MA course hosted a debate in partnership with the Progress Educational Trust about whether inherited mitochondrial disease a rare, incurable and degenerative genetic disease passed from mother to child should be treated with new techniques that have led to media headlines of "three parent babies". The panel, which was chaired by Sir Mark Walport, Director of the Wellcome Trust, and incoming Chief Government Scientific Adviser, included Liz Curtis and Alison Maguire from the Lily Foundation, who began the event by sharing their moving, personal stories of losing a child as a result of the disease. Mary Herbert, Professor of Reproductive Biology at Newcastle University, explained the process of the new treatment and Professor Martin Richards from the University of Cambridge discussed the social impact of the treatment. Finally, John Wyatt, Professor of Ethics and Neonatal Paediatrics at UCL, followed by Jackie Leach Sully, Professor of Social Ethics and Bioethics at Newcastle University, debated the complex and nuanced ethical considerations. Throughout the debate concerns were raised about the cost, ethics and unknown outcomes in humans by changing the genetic makeup of future generations as well whether scientists in the UK should tamper with the germ line breaking a worldwide pledge. At the end of the debate Sir Mark took a straw poll and the majority of the large audience was in favour of the new technique.